This year’s drawing subscription is based on some ideas that have been percolating in the studio for a little while now, as most ideas do. Inspired in part by the notes/writings of Steven Parrino, the decaying sounds created by the likes of Sunno))) and Wrnlrd, along with my long-standing fascination with ancient megalithic structures worn down by both time and lost belief, this second offering of the Drawing Subscription will take uniform compositions and cause the system to succumb to its own influence(s). These disruptions are meant to alter the surfaces of the works and force them into new territories. To take a given state and impose upon it the weight that is the vast history of monochrome painting, or Dark Matter dragging galaxies into one another, and see how these things affect the pure space of the picture plane. As we traverse 2012 together, let’s see what buckles, crumbles, and drops out of view, or unfolds into a new reality of spatial engagement. This image comes from an edition of the Cambridge Encyclopedia of Astronomy. 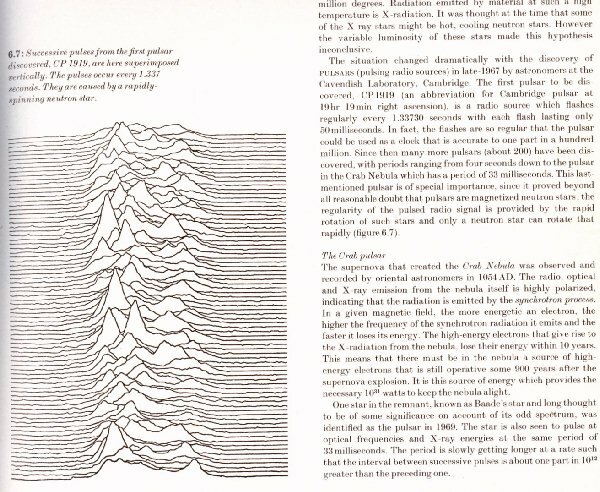 It presents successive pulses from the first pulsar discovered in July of 1967. Designated PSR B1919+21 it is located in the constellation Vulpecula.